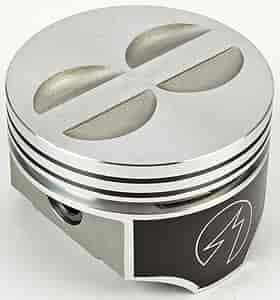 Sealed Power 350ci Stock Type Piston, .030" Overbore Piston Dia. : 4.030"
Speed-Pro developed Powerforged Pistons, and set the pace in powerforged technology. The high silicon VMS-75 alloy is found exclusively in pistons "powerforged" by Speed-Pro. Up to 3,000 tons of force forges aluminum slugs into the basic piston form, which creates a grain flow pattern in the structure providing excellent strength, ductility, and heat dissipation. Note: All compression ratios are approximate. They're figured with a gasket thickness representative of those commonly used. Does Sealed Power L2256F30 fit your vehicle? L2256F30 is rated 5.0 out of 5 by 2. Rated 5 out of 5 by ptukremling from Great pistons for the price. These pistons are designed for a 350 V-8 engine. I am using them in a 4 cylinder Iron duke Pontiac used for racing. Works great. Rated 5 out of 5 by marty from new design of piston Nice piston I only needed 1 though, I had 7 due to blowing my last 350ci chevy engine I built in the mid 80's plston is a different design from the old ones trw plstons. Piston skirts are shorter although the same design from the ring grooves up Nice piston I know it will work good in this new engine.